Background: A robust and validated analytical method is a key component at various stages of pharmaceutical product development to ensure identity, purity and quality of drugs and formulations. Objective: The aim of proposed work was to develop and validate a simple, sensitive and stability indicating high performance liquid chromatographic method for the estimation of venlafaxine hydrochloride in bulk and formulations for routine analysis as well as for preformulation studies. Methods: Efficient chromatographic separation has been performed on a HpyercloneTM 5µm BDS C18 column using a mobile phase consisting of a mixture of phosphate buffer (25 mM, pH 3.0) and acetonitrile (70:30 v/v) at a flow rate of 1 ml min-1. 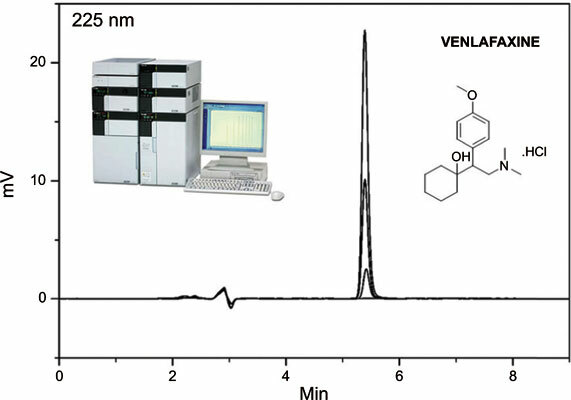 Venlafaxine hydrochloride was analyzed using UV detector at 225nm. Developed method was validated as per ICH guidelines. Results: The method has demonstrated linearity over the range of 100 to 2000 ng ml-1 with regression equation, mean peak area (y) = 93.32 x concentration - 322.00 (R2 = 1). The method has demonstrated good and consistent recovery (99.34 to 101.16%). Precision of the method reflected by the relative standard deviation values at intra-day and inter-day levels was less than 1.79%. The detection and quantitation limits were 6.55 ng ml-1 and 19.84 ng ml-1 respectively indicating sensitivity of the method. The method was successfully applied for the estimation of venlafaxine hydrochloride in marketed and inhouse formulations. Also, developed method was successfully used in drug-excipients compatibility studies for VEN. Conclusion: The method was found to be accurate, precise, sensitive and selective for the determination venlafaxine hydrochloride in bulk and pharmaceutical formulations. Venlafaxine, stability indicating, high performance liquid chromatography, analytical method, validation. drugexcipient compatibility.